Ever wonder how many ounces of silver it takes to buy a house? I got curious, so I went out and collected median single family home prices (source) and silver prices for the last 35 years and made a nice graph to chart the ratio. 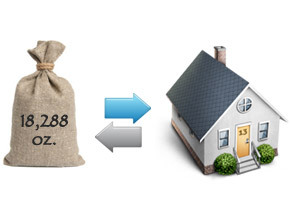 As of December 2014 it took 18,288 ounces of silver to buy a home! In 1980, when silver peaked at $49+ it only took 1272 ounces to buy a median priced home. To buy a house today for only 1272 ounces, the price of silver would need to be $235! Silver analyst Mike Maloney has gone on record to say that in the near future 500 ounces of silver will be able to buy a new home. For that to occur at today’s home prices, the price of silver would need to rise to $596 an ounce! I’m not big on making predictions, but buying a home for 1000 ounces of silver in the next 5 years is highly likely. What’s your best guesstimate on ounces for a home?